Bangladesh vs Sri Lanka, Asia Cup 2018: In the first match of Asia Cup 2018, team Bangladesh has geared up to take on Sri Lanka in Dubai in UAE. In the first match of group B match, both the captains Mushrafe Mortaza and Angelo Mathews will be looking to start the tournament with a win and dominate the pool. 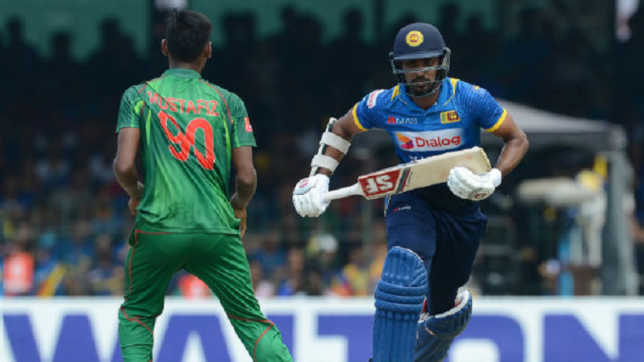 Bangladesh vs Sri Lanka, Asia Cup 2018: The battle between 6 best teams of Asia is about to begin and in the first match of Asia Cup 2018, Sri Lanka will face Bangladesh at the Dubai International cricket stadium. The Lankan lions will be commanded by Angelo Mathews, while Bangladeshi tigers will roar under the captaincy of Mashrafe Mortaza. The curtain raiser match is expected to be a thriller and entertaining encounter as both the teams will be looking to start their journey of the 14th edition of Asia Cup with a win. Both the teams have equally balanced sides loaded with young talent with the support of experienced players. For Bangladesh Mashrafe Mortaza, Shakib Al Hasan, Tamim Iqbal will be the key players. While Angelo Mathews, Thisara Perera, Upal Tharanga, Lasith Malinga and Kusal Mendis will wreak havoc for Sri Lanka. Angelo Mathews (c), Amila Aponso, Dushmantha Chameera, Akila Dananjaya, Niroshan Dickwella, Shehan Jayasuriya, Suranga Lakmal, Lasith Malinga, Kusal Mendis, Dilruwan Perera, Kusal Perera, Thisara Perera, Kasun Rajitha, Dasun Shanaka, Dhananjaya de Silva, Upul Tharanga. Mashrafe Mortaza (c), Shakib Al Hasan, Liton Das, Ariful Haque, Mominul Haque, Abu Hider, Rubel Hossain, Tamim Iqbal, Nazmul Islam, Mahmudullah, Mehidy Hasan Miraz, Mohammad Mithun, Mushfiqur Rahim, Mustafizur Rahman, Mosaddek Hossain Saikat, Nazmul Hossain.